Want to watch the sun set over the ocean from the comfort of your bed? 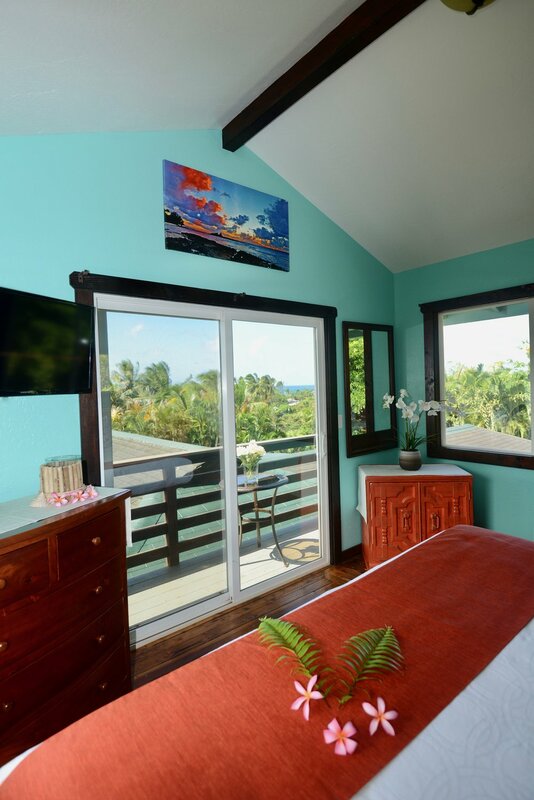 Facing out toward a 180-degree view of lush green trees and the sparkling blue ocean, this room is ideal for two people traveling together who would love the stunning view, great breeze, high ceilings, and private lanai (terrace). The bed can be split into two individual twin-size beds or one plush king-size bed, depending on what you request in advance. The Yellow Ginger Loft is an absolute beauty, and many of our guest's most-loved accommodation! If you are able to pull yourself away from this perfect space to go to any of the beautiful beaches nearby, we offer plenty of fresh bath and beach towels for you to use. With this room we offer air conditioning, cable TV, free Wi-Fi, bath towels, beach towels, a private security safe (large enough to hold a laptop), and on request we can offer a hair dryer, iron, and other amenities. Beds may be pushed together upon request.